Jane Lee Leonard of West Bloomfield was born July 9, 1935 in Darke County, Ohio to John Henry and Bertha (nee: Minnich) Mutzner. 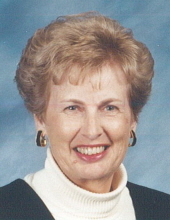 She died April 7, 2019 at the age of 83. Mrs. Leonard is the beloved wife of 62 years to Jack Allen Leonard. Loving mother of Kirk (Laura) Leonard, Cindy (Bill) Killian, Sandy (Kevin) Finnerty and Scott (Ann) Leonard. Grandmother of Tracy (John) Frith, Dan Killian, Krista (Jeff) Mitchell, Shamus Finnerty, Jeff Killian, Brenden Finnerty, Brittany Leonard, Amanda Leonard and Stephanie Leonard. Great grandmother of Wesley, Elliana, Kaylee, Emmett and Kalli. Dear sister of John (Marjorie) Mutzner, Peggy (the late Mike) Hemm, and the late Judy Kimmel Trebing Beckwith. Also survived by numerous nieces, nephews, extended family members and friends. A memorial service will be held at Lynch & Sons Funeral Home, 340 North Pontiac Trail, Walled Lake (3 Blks. S. of Maple Rd.) Saturday, April 20th at 11:30 AM with a memorial luncheon to follow. Friends may visit Friday, April 19th from 3-8 PM and Saturday 11 AM until time of service. Committal service will be at Glen Eden Memorial Park Cemetery on Saturday, April 20th at 10 AM. Memorials to the American Heart Association or the National Foundation for Cancer Research appreciated. 35667 W. 8 Mile Rd. "Email Address" would like to share the life celebration of Jane Lee Leonard. Click on the "link" to go to share a favorite memory or leave a condolence message for the family.